The original restaurant is in Allston, but even my parking mojo can’t conquer Allston, so I never attempted to go there. I was thrilled when I found out they opened a second location in East Cambridge, my old hood. I met my friend Regan there for dinner; it was Wednesday at seven and the wait was about 20 minutes long. The restaurant is small, but it was certainly hoppin’ with hipsters. 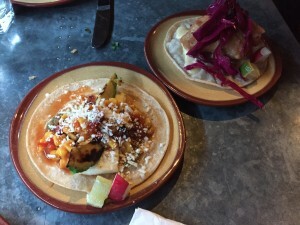 The menu is small as well, with only seven tacos available, and alongside some larger plates. The pricing is inconsistent. The tiny tacos feel like a rip-off at $4 each, but the nachos were three times the size and only $6. A medium torta sandwich was $13, which seems crazy. Go up the street to Olecito; their tortas are $9 and delicious. Our waitress warned us that all the food just comes out when it is ready, so she recommended to order in stages - that just feels lazy to me. I started with a carnitas taco, while Regan had a beef barbacoa and we shared an order of the aforementioned nachos. 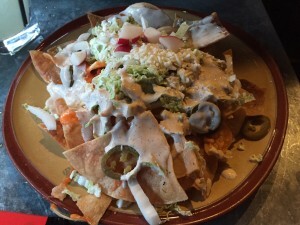 The nachos came topped with cheese, avocado crema, sour cream, jalapenos and, strangely enough, shredded Napa cabbage. I was weary, but it turns out I really liked the cabbage. I thought it added a nice crunch and freshness to the dish. At $6, it’s a far better choice. However, they did pack a lot of flavor into that $4 taco. My 3-bite carnitas taco was tender and flavorful with a bright salsa verde and cilantro. I didn't try the barbacoa, I wish I had. Regan liked it very much. Our next round of tacos, I opted for the Baja fish, which came with a lightly fried and battered tender piece of fish. I thought the pickled cabbage slaw was great, but the flavor of the chili mango aioli was non-existent. Regan had the grilled avocado with griddled queso, a decent option for the vegetarians (I got one of the 3 bites). Lone star seems like a great place to stop by after work, if you're hankering for a small snack. If you are hungry for more I would strongly recommend getting nachos because the tacos are not going to fill you up.